Mayor Bowser's Green Bank Bill! Mayor Bowser wants to make Washington, DC, the first city in the United States (and second in the world) to create a Green Bank! Mark your calendars. On June 23rd at noon, join the DC Environmental Network (DCEN) for our monthly networking event. 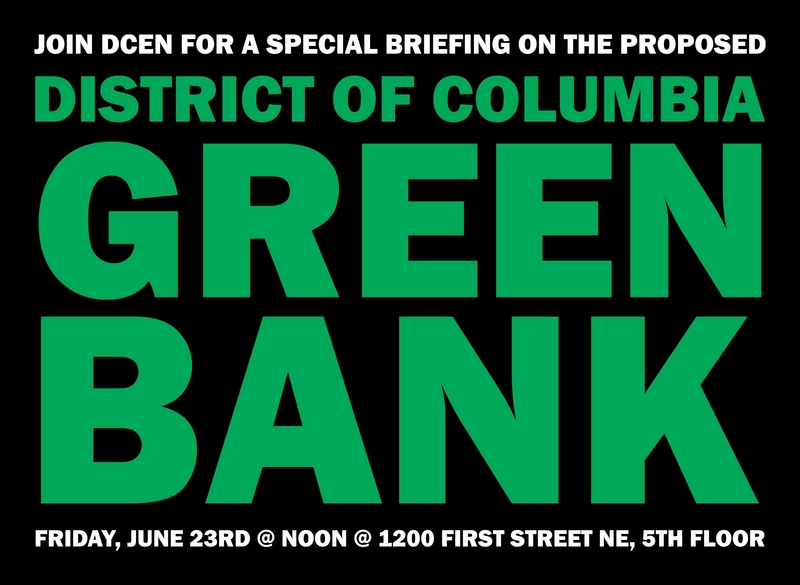 We are putting together a special briefing on Mayor Bowser’s legislation to create a Green Bank in the District. This DCEN event will be hosted by the District Department of Energy and Environment (DOEE) at 1200 First Street NE, 5th Floor. You can RSVP here! On April 25, 2017, Councilmember Mendelson introduced Mayor Bowser’s Green Bank bill, B22-0257, the District of Columbia Green Finance Authority Establishment Act of 2017. This legislation would create the District of Columbia Green Finance Authority (“DC Green Bank”) to increase the availability of financing for energy efficiency, clean and renewable energy, clean transportation vehicles and infrastructure, stormwater management, sustainable projects and programs, water efficiency, and green infrastructure projects in the District. You can RSVP here to attend this DCEN briefing! 1. 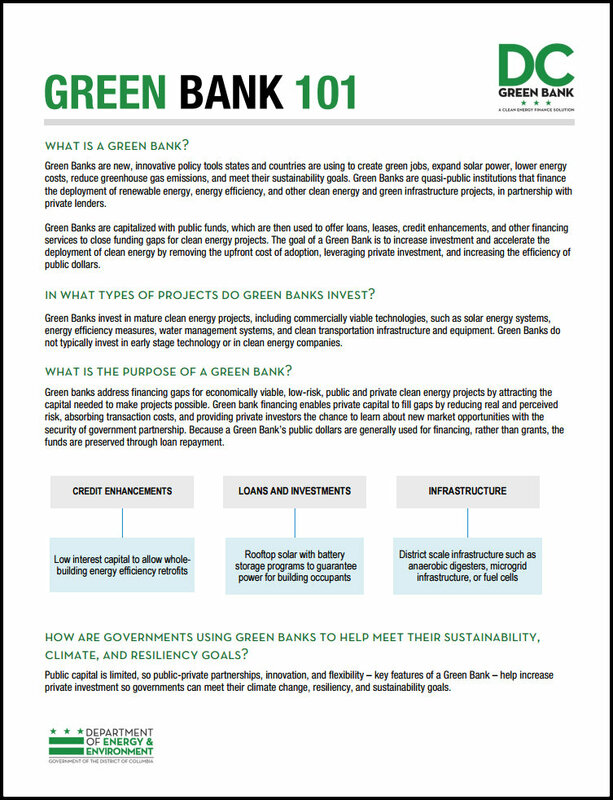 What is a Green Finance Authority (Green Bank)? 2. What other jurisdictions around the world are utilizing this finance mechanism? 3. How would the District’s Green Bank work and enhance our current finance setup? 4. There is a local Public Bank movement in the District. The Council is considering funding a DC Public Bank Feasibility Study in the next fiscal year. What is the relationship between a public bank and a green bank? Do they have overlapping elements? 5. For over a year and a half, DCEN has been involved in discussions focused on putting a price on carbon in the District. Several participants have asked whether some of the collected revenue could be used in support of a green finance authority? How might this work and what might be a meaningful contribution looking forward? Please RSVP here if you would like to attend! – Legislative Summary, Bill History, Introduction, Other Documents. Hope to see you June 23rd at Noon!